Keto, or the Ketogenic diet, has been around (in recent history) in various forms for about twenty years: the South Beach Diet, Atkins introductory phase, parts of the Paleo diet, really anything that incorporates a low carb philosophy. 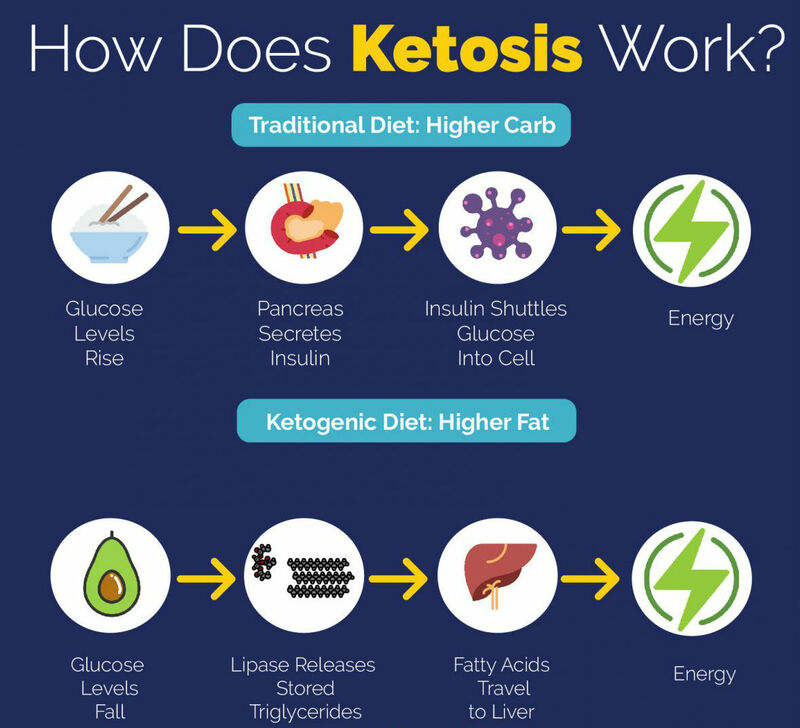 The basic premise of Keto is that in the absence of carbohydrates your body will automatically burn fat for energy. There’s a lot more to that which we will get into, but that’s the basics. Think about how a bear hibernates for the winter. It stores up food as what? Fat. Then it fasts (all sleep no eating) all winter and uses those fat stores to sustain its body. We humans can do the same thing. We’re about to jump into more details, but if you have ADD the TL;DR version is: stop eating carbs, lose body fat. How do carbs end up as fat? If you’re on a normal diet your body currently works like this: you eat, your liver breaks down all carbohydrates into glucose which is released into your bloodstream at the same time producing a hormone called insulin. Insulin is like a key which unlocks your cells and allows the glucose in to be used as energy. This isn’t a bad thing, your body is built to run on carbohydrates. Fat becomes stored in your body when you aren’t burning that glucose for energy through exercise or movement. Excess glucose is stored in the liver or if that’s full it gets converted into fatty acids, circulated to other parts of the body and stored as fat. How does keto burn fat? Your body is a finely tuned machine, the result of tens of thousands of years of evolution. It’s capable of far more than we know, but here’s what we do know: your body can adapt almost instantly to a variety of environments and inputs. If you cut the carbs from your diet it signals your body that you will need to do something else for energy, since there’s no carbohydrates to break down into glucose. So your body begins to break down your fat reserves into ketones, which are then used by your body as fuel. It’s really as simple as that: cut your carbohydrate intake and your body will automagically start burning your fat reserves. No crazy exercise or subscription membership required. What do I eat on Keto? Water. Drink a ton ton ton of water on Keto. Even the best plan can come with pitfalls, and keto is no different. The biggest complaint about Keto is something called the “keto flu” which is a period of transition as the body goes from burning glucose for energy to burning fat for energy. This isn’t fun, but can be avoided by kickstarting ketosis through the use of exogenous ketones (exogenous = outside, or ketones produced outside of your body). I personally have experienced muscle cramping due to not drinking enough water or not having enough electrolytes. I take supplements for magnesium and potassium and as long as I take those I don’t have any issues. There are plenty of supplements to be found for both problems, and even some that combine electrolytes and exogenous ketones. Alcohol isn’t good for your body. That being said, it can be a lot of fun and a social lubricant so it’s hard to avoid. If you must drink on keto, I stick to low or no carb options. For beer I do Michelob Ultra, harder stuff Vodka + soda and tequila on ice. One thing to note is that alcohol is treated as a toxin by your body. It’s prioritized for processing by your liver in front of everything else, so while your body is metabolizing those shots you’re not burning fat. Might as well hit the dance floor. You can go as deep as you want on coming up with meal plans for keto, and there are tons and tons of recipes out there. As you get more advanced in your keto journey you will want to use a Macro Calculator to come up with how much fat vs protein vs carbohydrates you should be eating.